Sherwood Guest House HotelA warm welcome awaits you at the Sherwood Guest House and Bed and Breakfast in Llandudno personally run by the proprietors Kevyn and Cita Jackson. The guesthouse is in a magnificent position on Llandudno's beautiful Promenade; we offer comfortable friendly and relaxing surroundings. A warm welcome awaits you at the Sherwood Guest House and Bed and Breakfast in Llandudno personally run by the proprietors Kevyn and Cita Jackson. The guesthouse is in a magnificent position on Llandudno's beautiful Promenade; we offer comfortable friendly and relaxing surroundings. We have rooms to cater for parties of all sizes, large or small. Our guest house and bed and breakfast accommodation is ideally located to reach all local amenities including the Llandudno theatre and conference venue. 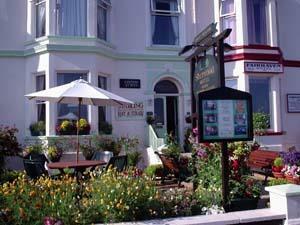 We are only a short walk or very short taxi ride from Llandudno train station. 1 car parking space per bedroom. Children welcome from any age.